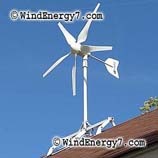 http://www.WINDENERGY7.COM – – Wind Generator Kit For Sale. 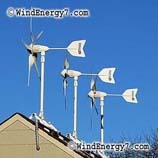 Need a Wind Generator for your home. WindEnergy7 is the right place to buy your wind generator because they sell COMPLETE systems with COMPLETE technical support. 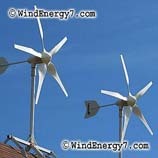 Many customers of WindEnergy7 will install their systems themselves. WindEnergy7 LLC — Ohio Based Home Wind Turbine, and Solar Energy Product Manufacturer. Inventor of the RoofMill™, the first and only complete Wind/Solar Hybrid system kit. We also sell the TowerMIll™, the fist and only complete engineered Wind/Solar Hybrid system for use as a tower mounted Home Wind Turbine system. The RoofMill™ system from WindEnergy7, an invention creating green jobs for US workers. The RoofMill™ provides free electricity, energy security, lower carbon footprint, and emergency back-up power for your residence. From the day of installation, a home windmill has improved your property value. Additionally, you will save money on your electric bill from that day forward. You can install the home wind turbine system yourself, or get an estimate from your local Electrician for a turn-key installation. You can also become the local dealer if there’s not one already established. The TowerfMill™ system from WindEnergy7, another innovation creating green jobs for US workers. The TowerMill™ provides free electricity, energy security, lower carbon footprint, and emergency back-up power for your residence. If you have the space for a windmill tower, this product may be something you would like. You will save money on your electric bill from the day it is installed. You can get an estimate from your local Electrician for a turn-key installation. We will train and support all the people involved to get it done. You can also become the local dealer if there’s not one already established. To see more videos of our home wind turbines, go to — WindEnergy7.Com — and you can find info about becoming an owner, installer, or dealer of our rooftop wind turbine RoofMill™ systems, or our new tower mounted wind turbines the TowerMill™. There are still areas open for new dealers to become the local source for wind/solar systems. So, if you are interested in becoming a home wind turbine dealer fill out the Contact Form at — WindEnergy7.com — and we can see if your area may still be open for you to become the home wind turbine dealer for your surrounding county territory. You can buy a system online and we ship by UPS. If becoming a dealer interests you, See The Turbine Dealer Video. You may become a dealer and or installer if you like, just fill out the Contact Form and let us know what we can do to help you. Wind Turbine Blades. Our wind turbine blades are made from an advanced thermo-fyberplastic to an exacting tolerance for perfect balance and aerodynamics. Blade pitch is carefully tuned to give good start-up in low winds and at the same time not much drag at high speeds. Since the RoofMill is the only successful roof mounted turbine system, we have engineered our systems to have the minimum of noise and vibration. To do that, our wind turbine blades are very important. Our elimination of noise and vibration has made our systems longer lasting than others because of how smooth and perfectly balanced our systems are under heavy wind. Home Wind Turbines – You will find links to pictures that I have published of home wind turbine rooftop system installations done recently.